Hindi for Beginners is a Hindi self-study guide and language learning package aimed at helping students learn Hindi in a natural manner. It engages them to use the Hindi language in real life situations actively. An accompanying audio CD with clearly annunciated dialogues spoken by native Hindi speakers ensures correct pronunciation and builds listening comprehension. Clear task-based instructions, concise and to-the-point explanations of grammatical structures, and lesson plans help enhance student's understanding and speed up their ability to learn Hindi. 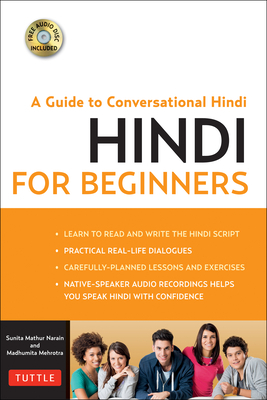 Hindi for Beginners can be used for instructional purposes in a classroom setting or to maintain individual linguistic capabilities such as reading, listening, speaking and writing through a wide array of activities. This book also includes the Romanization of vocabulary and dialogues as they are pronounced, to help learners pronounce them correctly and clearly in the absence of a Hindi speaker or a teacher, without any difficulty. Sunita Mathur Narain, a Hindi language educator by trade and a musician by training, lives in the United States and has been teaching Hindi to adult learners for past 14 years in the United States. She has taught at the Diplomatic Language Services, Inlingua, and worked as a reviewer, editor and translator at the University of Maryland & SCOLA. Originally, Sunita hails from the city of Ajmer in Rajasthan, India, where she graduated with a Master's of Arts degree in Indian Classical Vocal Music from the Ajmer University. Sunita is the co-author of Survival Hindi. Madhumita Mehrotra was born and raised in the Indian state of Uttar Pradesh. She has taught English and Hindi to thousands of students over a period of 30 years, in various language institutes in the US. She is a certified Hindi language tester and works as a target language expert and Hindi audio reviewer. In addition to her career as a teacher, Madhumita has also served as a TV presenter (Hindi) for over 15 years, is a classically trained Kathak dancer, and has performed in many Hindi stage and television plays and regional movies in India. She is the co-author of Survival Hindi.